A group of students from Springhallow School recently came to our Haven Green site office to help plant vegetables. The pupils were aged 4-16 years and have a diagnosis of Autism. They sowed tomatoes, potatoes, carrots, beetroot, mint rosemary, chives, mint, sunflower, wild poppy and lavender flowers. They also planted sunflowers in pots which they took back to school with them. The planters were recycled from the project’s waste drainage pipes and wooden pallets, and spare and unwanted garden tools were donated by project staff to reuse materials on the scheme as much as possible. The project has recently started using Smart Cara food waste processors to reduce the size of food waste and in the process, produce a nutrient rich soil enricher (without chemicals). The soil enricher was mixed with compost and used for planting the vegetables. A rain water harvesting system was also recently installed at Haven which is used for watering the vegetables and flowers. 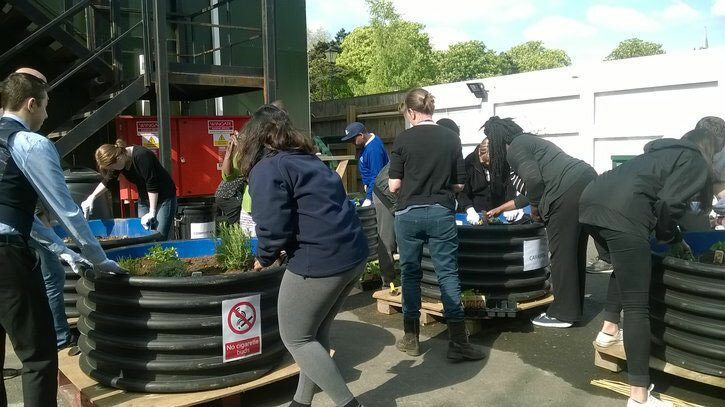 To encourage the office staff to connect to their natural environment, volunteers will water and maintain the vegetable garden, and all produce will be donated to Ealing Soup Kitchen or project staff.